Something more formal for a change. Grey suit and black shoes, so pretty much as formal as I go. Something what I would very much like to wear every day if I worked in a bank. Which I don't, so this is just those days that I feel like keeping myself in line and dressing a bit more formal. The suit is my grey Cavaliere, and this picture, despite the slightly bad pose, shows how the soft shoulders really look good by following the body's natural lines. 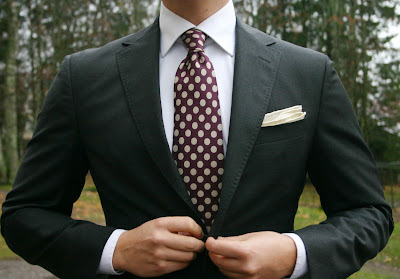 The shirt is white and the tie a 7-fold silk tie with Tom Ford kind of polda dots - ones that get more elliptical the narrower the tie gets. The background color is burgundy and the dots are cream, as is the pocket square. The shoes are black quarter brogues, a type of oxford shoes that I quite like. Not as musty as full brogues, but a bit more playful than normal toe caps. Socks here are grey cotton and I think my trousers have been a tad too low in the pictures, the break is a bit stronger than it really is. Heh, I actually like cap toes a lot. 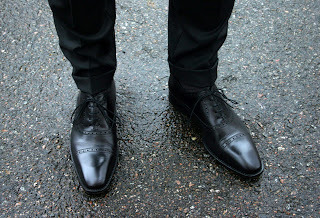 Full brogue oxfords are the ones that make me wanna go and get my sartorial flamethrower and start burning stuff.